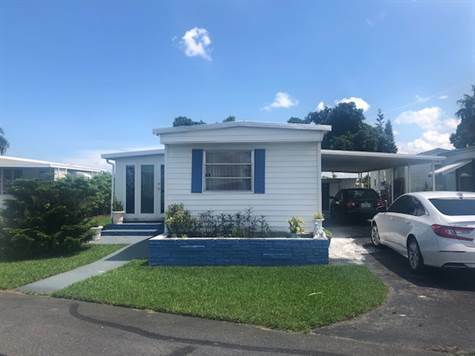 2 Bedroom and 1 bathroom with newly remodeled Florida room. Home has tiled floors through-out. Has a carport and is located on a quite street in an active 55+ community. Nestled in one hundred acres of lushly landscaped tropical splendor, Everglades Lakes an adult 55 plus community, offers resort quality affordable South Florida retirement living. With spacious homesites, lakes and canals, swimming pools, an active clubhouse and more, we invite you to join us! This beautiful community has 612 well maintained lots, a recreation building, a card room, pool room with pool tables, kitchen facilities in the building, men’s and ladies rooms each have steam rooms, exercise room, 2 swimming pools (one that is heated at parks discretion), whirlpool, laundry facilities with 18 washing machines and 10 dryers, cloths lines in an enclosed area, 8 shuffleboard courts, and a putting green. The lawns are cut by the community and there is a 24 hour manned security gated entrance. Garbage pick-up is provided twice a week. A small (under 25 lbs non-aggressive breed) pet is welcome.